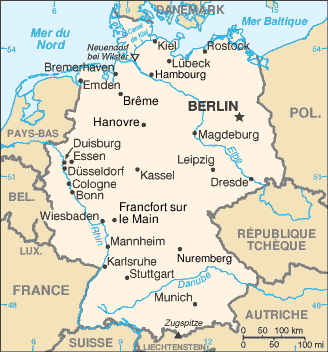 Germany : When and where to go? Spring and autumn are also good options, particularly the months of May and September when there is little rainfall and the temperatures are agreeable. Winter should be avoided: Severe cold in certain areas, frequent snow, fog and rain means this truly is not the best time to explore the country! Berlin, the capital represents the best of Germany; you will be seduced by this vibrant town with its renowned night life, great green spaces for relaxing, its numerous buildings splendid in their architectural style and museums filled with a huge variety of treasures. Munich is the other must-see during your visit to Germany; very cosmopolitan, vivacious with its numerous picturesque cafes and various museums dedicated to different fields of art and technology. Do not miss the memorial to Dachau Concentration Camp, your visit there will make a lasting impression. The whole of Bavaria is a great place to tour round; Oberammergau with its painted houses, the castles of Hohenschwangau and Neuschwanstein and also Linderhof, the medieval town of Nurembur and its museum, Ratisbonne Cathedral and the Bayreuth Opera House are just a few examples of the marvellous places you will find along the way. Those who are feeling energetic may wish to go the Frise Islands, criss-crossed by hiking paths and ideal to practice cycling or horse riding in a natural and light filled landscape. Many airlines provide a service to Germany landing at Berlin, Munich and Frankfurt but it is also easily accessible by train or bus. An identity card is sufficient if you are a citizen of the EU. The budget to plan for is quite large. You will eat very well for approximately €20, and a reasonable double room will cost you around €100. Try to find guest house rooms (announced by the Fremdenzimmer sign) as an interesting and fairly easy to find alternative, in towns as well as rural areas. Visits to the museums will no doubt constitute an important activity, not to be neglected as they are numerous and fascinating. There is no particular health problem to be aware of, except the presence of ticks in Bavaria in spring, with a strong risk of transmissible lyme disease of which campers should be aware. To travel inside the country, the train is the ideal solution: Cheap, reliable, it serves numerous towns. The road network is also very efficient. If you wish to take home some souvenirs of your stay, think of Meissen porcelain, silk scarves, beer glasses, the famous cuckoo clocks from the black forest and the no less famous Birkenstocke shoes, internationally known for quite a while now.